Blending Traditions : The couples who are engaged in an International Marriage have a tougher time blending their traditions. These couples are mostly from very different communities and are followers of different religions. Therefore understanding traditions of each other may be a bit difficult for them. In this case both the bride and groom have to work harder to understand each other's cultural expectations. In an International Marriage it is extremely important that the couple understand and respect each other's religious faith and traditions. Language : Love has no language and getting married to someone who cannot speak your language is not a big issue but communication is important in any relationship. Especially, in Marriage it is important that the couple understand each other's language. The children of couples who belong to different countries should be taught languages of both mother and father. The couple should also give children the freedom to communicate in whichever language they choose to. Legal Issues : Visa or Immigration concern is another issue that couples engaged in an International Marriage have to face. There is a lot of paperwork involved in attaining visa or immigration documents but the couple can deal with it by getting a proper legal advice and help. Settling A Home : Couples who belong to different countries mostly have their homes in different countries. In this case one has to leave his/her country in order to settle down with the other in his/her country. This decision is quite difficult but with love and understanding the couple can easily combat this issue. 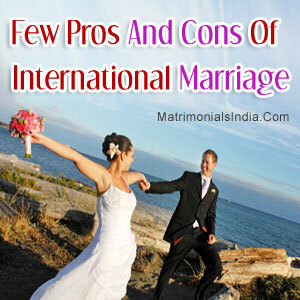 No matter how difficult it is to get married to someone who does not belong to your country, International Marriages are still quite prevalent nowadays. The reason behind the prevalence of this institution is love and understanding which are essential to make any marriage successful.